I hope you don't mind?! These are just so darn good! The resto thread under a subsequent owner. Also, I have to say that this thread will grow as Mart acquires more cars to bring back from the brink of death so "stay tuned" as they say...Your browser does not support drag'n'drop file uploads.Please use the fallback form below to upload your files like in the olden days. Last edited by grifterkid on Tue Dec 30, 2014 1:39 pm, edited 2 times in total. A true ambassador for the marque and a testament to his work. Ash, that was a brilliant idea of your's of featuring all of Mart's restos in one place. I don't think Mart will stop until he has done one of every year and one of every colour! I do hope that more Sprints and other memebers of the small Triumph family get the 'treatment' from Mart as stunning just doesn't sum these cars up! 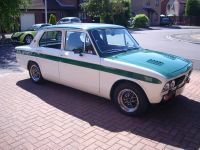 I think a 2500 estate next would be quite a tasty project... That or a Stag perhaps?! When I read the title I thought you were proposing a museum for these cars Ash! Good idea grouping them together. for two reasons, firstly these were undertaken by relative beginners and secondly these are less sought after models? Ian, how about one thread (a sticky) for the OHV cars such as these? Job done! I've added a few other OHV resto threads to the list. Thank you grifterkid for starting this thread and everyone for their kind comments. I feel very honoured (and a little embarrassed). I've just added XJX to the roll of honour.